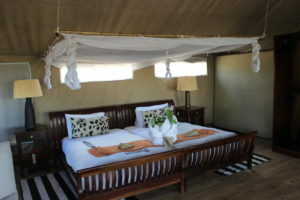 Linyanti Bush Camp is set on the edge of the Linyanti marsh, in a private concession which borders on the western edge of the Chobe enclave, and is thus away from the busier northern areas of the Park. This is a small and intimate property, accommodating only 12 guests, in well appointed tented accommodation, with en suite facilities. 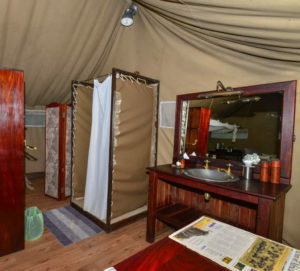 The main Camp area is also tented, and houses the dining area, library, bar and lounge, all of which overlooks the Linyanti Floodplains and marsh. 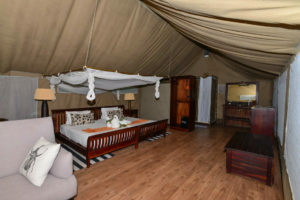 You can explore the area on game drives (morning and afternoon), and night drives, with spotlight, allowing you to see the night life of the area. In addition, you can enjoy guided walks, adding to the authentic safari experience that Linyanti Bush Camp prides itself on. The Linyanti area is well known for healthy populations of elephant and buffalo, and there are large concentrations in the dry season (generally June to September). You also have excellent chances of seeing the magnificent sable and roan antelopes, whilst there are frequent sightings of lion and wild dog. As this area has diverse habitats, you also have the chance of seeing the rare and elusive sitatunga antelope, red lechwe (both more common in the Okavango Delta), hippo and crocodile in the surrounding marshes. The area’s relative remoteness makes it a favoured wild safari destination. 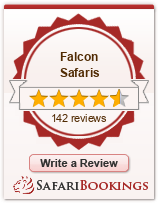 The camp is also ideal for birders, with excellent year round sightings. Generally only children 12 years and older accepted.